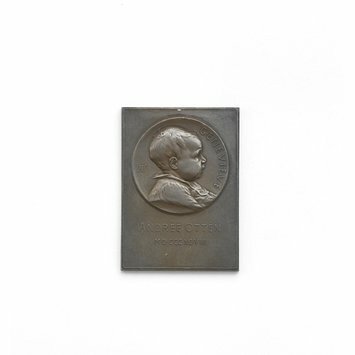 This silvered copper plaquette depicts GENEVIEVE ANDRÉE OTTEN M. D. CCC. XC. VIII to the right in a medallion. It is signed with the name and mongram of A. Lechevrel and was executed by the electro-deposit process. Plaquette, silvered copper, executed by the electro-deposit process. GENEVIEVE ANDRÉE OTTEN M. D. CCC. XC. VIII. Bust to right in a medallion. SIgned with the name and mongram of A. Lechevrel. GENEVIEVE ANDRÉE OTTEN M. D. CCC. XC. VIII. Bought for £1. 11s. 3d. Geneviève Andrée Otten, silvered copper, by Alphonse Lechevrel, French, 19th century, 1898.